Automakers across the industry continue to rollout plans for electric cars, but their success is contingent on consumer demand rising over time. That’s not all, however. The supply of crucial minerals for electric car batteries is in limited supply, as we’ve covered repeatedly in the past. That presents an obvious issue, but scientists working for American Manganese Inc. in the suburbs of Vancouver now think they have a new way forward. Several thousand miles away from the Democratic Republic of the Congo, where most of the cobalt supply is concentrated, the new approach could provide enough material to power “all the electric cars on the road today without drilling into the ground,” reports Bloomberg. How will they do it? Recycling bad batteries. It’s one of many technologies that entrepreneurs are patenting to prepare for a time when electric cars outnumber polluting petrol engines, turning the entire automotive supply chain upside down in the process. Instead of radiators, spark plugs and fuel injectors, the industry will need cheap sources of cobalt, copper and lithium. Innovators like him have made so much progress that the likes of Tesla Inc. and Toyota Motor Corp. could count on recycling for 10 percent of their battery material needs through 2025 if companies roll out large schemes, according to Bloomberg New Energy Finance. That will ease pressure on lithium and cobalt, whose prices have more than doubled in the past year. The DRC presents a number of issues on its own, Bloomberg notes, wracked by violence and corruption. Some cobalt mines in the country rely on child labor as well. 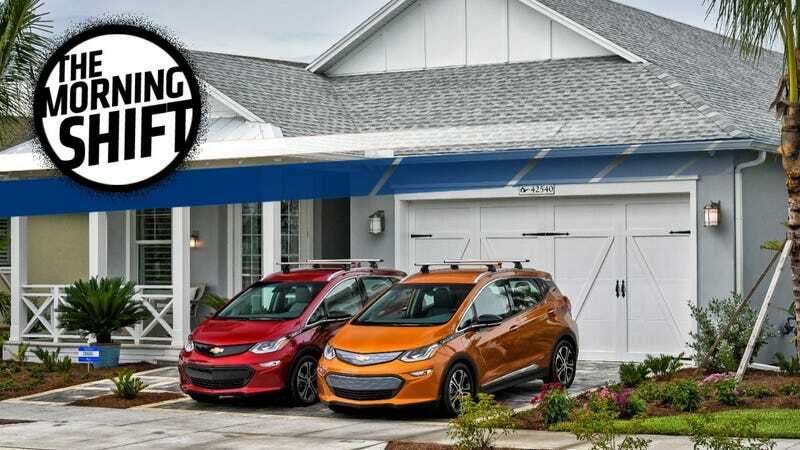 With the number of models planned across the industry—General Motors has 20 electrified models in the pipeline alone—it’s something the industry surely is considering right now. Tesla regularly shies away from auto shows, but the electric automaker set up a booth at this year’s LA Auto Show. Expectedly, its presence alone has garnered gobs of attention, as Tesla has an actual Model 3 on display. For the 450,000 reservation holders in line for the all-electric sedan, which starts at $35,000, a $15 ticket to the auto show could be their first chance to see the vehicle up close, since production launched—slowly—in July. As Bloomberg notes, however, the car’s sealed shut. The automaker led by Elon Musk has a locked-up red Model 3 sedan on display at the Los Angeles Auto Show that opens to the public Friday. While the doors will stay sealed shut, even up-close looks at the exterior have been hard to come by. Tesla has restricted initial deliveries to its own employees, and Musk’s struggles getting mass production up and running has kept the car out of the hands of customers. One Tesla shareholder who’s planning to visit the show told Bloomberg he has a “team of people scouring for Model 3s all over Los Angeles,” I’m just not sure why. It’s a car. Whatever the case, reservation holders who’re near the front of line recently got an email from Tesla, allowing them to finally configure their Model 3s. Their cars, according to the email, should be ready within four weeks. So we’ll see if Tesla gets a Model 3 in the hands of a non-employee by the end of 2017. A weird case popped up in Michigan this week, after residents in the city of Brighton Township filed a lawsuit against General Motors, claiming the automaker knew about “extremely high concentrations of sodium chloride” in their water for more than a quarter-century. The problem, the suit claims, is that GM failed to notify any regulatory authorities or residents about the issue. The suit cites sodium chloride contamination resulting from more than 30 years of operation at the Milford Proving Grounds. The suit alleges GM actively concealed and ignored the level of pollutants leaching into groundwater and drinking water sources until 2014. The contamination allegedly caused damages to vegetation and personal property, and also caused negative health effects such as hypertension and kidney stones. The amount of salt used at the proving grounds was as much as 7,430 tons in the 1990s, compared with the 13,800 tons used for the whole of Livingston County, according to the suit. The suit requests a financial settlement and asks the court to require GM to reimburse clean-up costs. GM, in response, told WXYZ the suit doesn’t have merit. Volkswagen, still reeling from the disastrous Dieselgate scandal, is trying to push out a new fleet of electric cars. The company said this week that it’s planning to accelerate that effort, thanks to a boost of profits from sport-utility vehicles. The namesake VW brand will initially develop five all-electric models, taking on Tesla Inc. with its coming I.D. vehicle range, it said Thursday at a press conference at its headquarters in Wolfsburg. The push will be aided by rising profit margins, which are now targeted to reach between 4 percent and 5 percent of sales in 2020, up from a previous estimate of at least 4 percent. The planned total investment is around $27 billion, notes Bloomberg. If anything, it’s a surefire sign the electric vehicle market’s going to be crowded in the next few years. I really, really think they’re serious about making the Microbus again. Nissan Motor is trying to recoup more than $770 million from India in a new dispute over unpaid state incentives, reports Reuters, over an agreement that dates back nearly a decade. Incentives are a big deal when it comes to building factories! You better believe it. It’s an interesting topic—that automakers could be pouring a ton of money into electric vehicles, and there might not be enough minerals to support the demand. Do you think the suburbs could save the day here?